I love quinoa, as I'm sure you do, too. Is there someone out there that hates quinoa? I hope not! If anything, I wish there was more readily available pre-packaged quinoa based meals. So with that said, I was eagerly anticipating these Spicy Italian Quinoa burgers from Qrunch. Everything about these burgers sound delicious to me. And since they are made with quinoa, they are gluten-free, soy-free, nut-free and dairy-free. Perfect for almost anyone! The flavor is spicy without being too hot. 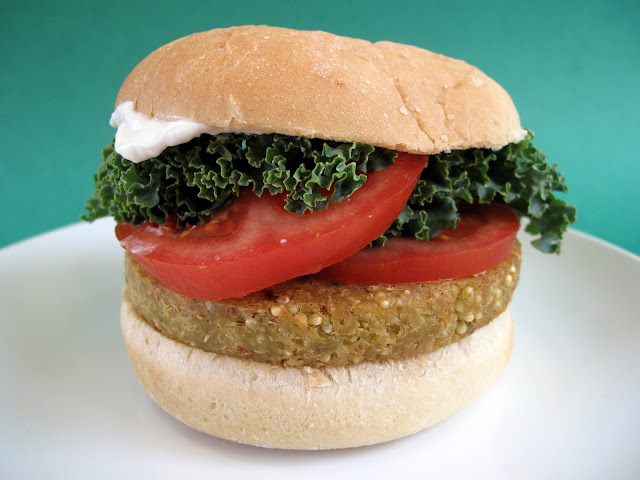 I love topping it with Vegenaise, lettuce (or kale) and tomato to compliment the spice. The patty is pretty dense and very filling. I would describe it as breaded "chick'n"-like, crispy on the outside and soft inside. Their preferred method is an oven or skillet but I prefer a minute and a half in the microwave, even though they tell you not to. My only complaint would be the price ($7.50 or so for 4) but to me it's worth it. 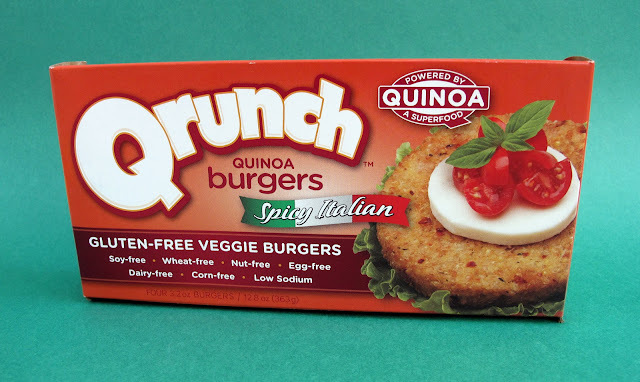 If you're ready to spice things up a bit, and want to try a different kind of veggie burger I think the Qrunch Spicy Italian Quinoa Burger is an awesome choice.